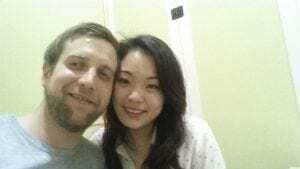 A British husband is taking legal action after his South Korean wife was locked in a cell and refused entry to the UK – despite being given permission by the Home Office. Michael Harbrow’s wife Jihyeon, 27, was arrested by border force officials as she got off the plane at Heathrow Airport. She spent “six or seven hours” pleading with officials before being put back on a plane to South Korea without her husband. The couple have been together for four years and hoped to renew their wedding vows in front of his terminally ill mother. Michael, 34, said: “They were rude to her, they shouted at her and treated her very poorly. “Before her arrival I had called the Home Office and it said it was fine. “We asked for a translator which wasn’t given. She has never broken the law in her life but had to spend the night in a cell. “When I tried to reason with them on the day for six or seven hours on the phone they just wouldn’t budge. “They said ‘once we have made a decision, it is final’ and I said this isn’t a decision, this is stupidity. “There is just no reasoning with them. They arrested her under some section of a law and she was in a cell like a criminal. The Border Office have told Michael he now needs to apply for a spousal visa which could take months to get. Michael said: “This will cost me an additional £2,000 for visa plus another plane ticket. Michael and Jihyeon Harbrow. Jihyeon was locked in a cell and refused entry to the UK – despite being given permission by the Home Office. Michael flew back to the country a little before Jihyeon because he wanted to plan the wedding and spend time with his terminally ill mother. The couple had hoped to renew their vows in March as Michael’s mother has been told she only has three months left to live. Michael, of Colchester said: “Mum has got terminal heart failure and this has been stressing her out even more. “It is not good for her, she was told she had three months to live about six months ago. And after a “long and tedious” process of making preparations with the Home Office the couple were told everything was all set for their travels. Private academy school teacher, Michael said he had followed every one of their instructions to the letter as he initially hoped to bring his wife to Britain for six months. In addition to this, Jihyeon completed the online form to check if she even needed a visa and it said she did not even have to apply for a visa. Michael said: “It is absolutely ludicrous. “They could have looked at the facts in my opinion and come to a decision that wasn’t so cruel. “The system in place is so confusing even for the people who work there don’t know what the best thing for them to do is. “For the most part it was trying to speak to a brick wall. Michael met Jihyeon in Ulsan, South Korea whilst he was teaching and she was studying. Michael said: “We met when I was out one night. I got engaged to her in the Philippines two years ago and we married last year in June. “She is upset and her father who is an international businessman who was willing to invest a lot of money in the UK is now very angry about how she was treated here. The wedding has now been postponed to July. But if this is not sorted Michael would lose the entire amount of money invested into it. Michael said: “I have spent £7,000 for wedding venue which is a large percent of my savings I came back with, plus I have to ring everyone and tell them. A Home Office spokesman said Jihyeon Harbrow did not meet the immigration rules for visitors. The spokesman said: “It is open to any non-EEA national wishing to settle in the UK, including those wishing to join their spouse, to apply for the relevant visa. What’s with some of the English in this article?!! It’s really bad, sooooo informal! British people paying a severe price for the complete open border to the entire EU (510 MILLION) where all can come to the UK at the drop of a hat, yet law abiding spouses of law abiding British Citizens are treated this way!, it is OBSCENE!. The minimum income requirement of £18,600 for British Citizens wishing to sponsor their non EU Spouse has caused heartache and misery for thousands of British families since its introduction in July 2012 by Theresa May as Home Secretary in the Coalition Government. Thousands of British families have been divided across borders, with children forced to maintain a relationship with a parent via Skype. Others are exiled from the UK, unable to return as a family or to maintain relationships with British grandparents and other relatives. These laws do NOT apply to non British EU ‘Citizens’ living in Britain (or it seems ‘Royals’) who may sponsor their non EU Spouse to live with them in Britain immediately.